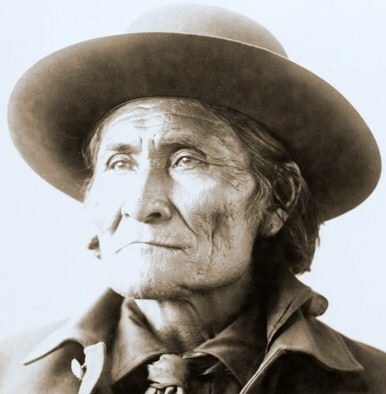 Geronimo is one of the most famous indian leaders. He is famous, infamous at the time, as his band of 36, including 20 women and children were the last hostile indians to surrender on September 4th 1886. This in effect brought an end to the Indian wars, although the Ghost Dance problems with the Crows in 1887 and the Sioux in 1890 post dated his surrender. 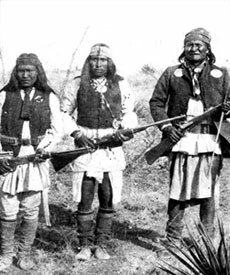 Geronimo, who led the band with Naiche Cochise's son, was hunted by 5000 soldiers and Apache scouts under General Miles. Without the assistance of fellow Apaches hostile to Geronimo they would probably still be free. As it is very small numbers of Apaches remained thereafter in the wild mountains of Northern Mexico and reports of them raiding continued into the 1920's. Their descendants may still be there. 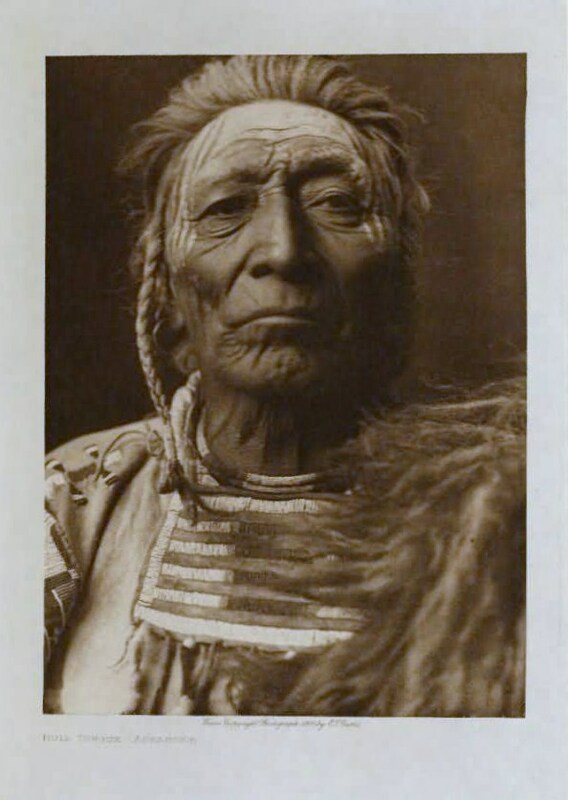 The above photograph was taken at the Trans Mississippi Exposition in Omaha, 1898 when Geronimo would be nearly 70. This is Geronimo, on the right, at around the time of his final surrender. He would be about 57. Contrast this with his later more civilized appearance when he appeared in circuses and generally capitalized on his fame, including selling pictures of himself.. The reason for two versions is that I first did the version above in a sort of rosy sepia colour. There is a story why I did but I won't bore you with it. Initially I was pleased but gradually realised the colour did not reflect the dark side of Geronimo, the hard eyes and slash of a mouth. I then did the second version with slightly different dimensions. Comparing the two I thought I might be able to improve the intial painting and put some additional washes on it to darken both the face and the hat, with slight touches on the clothing. Colours used were Cadmium Red Pale, Raw Sienna, Cerulean Blue and Ultramarine Blue. Touches of Hookers Green around the eyes with Viridian and Permanent Carmine for the tie. Raw Sienna, Raw Umber, Quinacridone Gold also featured in the clothing with Ultramarine and either Burnt Umber or Burnt Sienna for the darks. I an fairly pleased with both these portraits. Having attended three CR courses, own most of his books and videos, I have compiled a list of bullet points that Charles constantly emphasizes. Here they are in no particular order. 1. First Squint - less is more -is image dark against light - light against dark? 2. Vary finish. Adjust value and colour intensity throughout painting. 3. When short of time begin with darks. 4. Shadow and cast shadow shapes are painting foundation, close in tonal value, but colours varied and mixed on paper. 6. Patience and timing! Don't hurry! 7. Basics. Shapes, good tonal value, first try and lose boundaries when two similar tonal values meet. 8. Magic Triangle (1). Three dominant colours or local value shapes form a triangle within painting, two near two of the boundaries and third nearer third boundary or closer to edge. 9. Mix on paper. Less mixing cleaner and clearer colours. 10. Magic Triangle (2). Find two or three elements that you really want to paint. Paint as carefully as possible then omit or simplify rest. 11. Design your page. using areas of explicit detail. 13. Edge Control. Soften edges when painting. Squint if easy to see make it hard, if difficult soften. 15. Background should support subject but not dominate! Is something in background essential or potentially dangerous? If so leave out! 16. Buildings. Darker tones and detailed towards top. Simplify and lighten middle section, darker tones and more detail at base. 17. Creating success. A. Shapes, local value and edges. B. Colour. 18. When outdoors always paint from dark to light. 19. Buildings. NEVER paint your minds conception of a building. Paint a collection of beautiful colour and shapes, that suggest a building. 20. Loosening up is a state of the mind! 21. Clean palette regularly when painting. I've just added points 20 and 21 (20 -09 -10). I should have said earlier that while I would like to say I follow all the above religiously that isn't always the case. One gets carried away - at least I do - and sometimes (often?) plunge in where others fear to tread. There is a dilemma with watercolour that centres around the spontaneous nature of it. Charles and others talk about `happy' accidents (and unhappy ones) and to adopt an over deliberate approach can mitigate against the wonderful possibilities of this medium. Many will disagree, especially those who go in for super realism. Each to his own I say. One of the points above says don't hurry but take your time. In the two artists I mostly lean to, Charles Reid and Judi Whitton, they both take regular breaks when painting. I should emphasize that the above is the Charles Reid way. Other artists may well differ and offer completely opposite `rules'. When I read my first CR book, the 2001 flower painting one, I found it difficult to assimilate the quite different approach he advocated. I put it to one side but found myself returning and gradually becoming interested and then a convert. I should say I am not a sycophantic follower, some of whom you meet on his courses. I don't rave about everything Charles does, being especially interested in his portrait, figure, and still life work, the latter combining flowers and other objects. There is good stuff in the other subjects he paints but those are my priorities. I mentioned different approaches. This is something the would-be artist should beware. Different artists say different things and some of it is very contradictory. It is easy to become confused and this - to me - is the problem. Don't take what anyone says as gospel - they aren't always right. This is particularly so regarding things like paint choices. I may post something more on these lines at a future date with examples to prove my point. Regarding the above though I feel much of what Charles says can be usefully applied, regardless of whatever style you choose. I finally received the consignment of Moldau watercolour paper from the Czech Republic that I have been seeking since late last year. The paper has one surface which is Not like and the weight is 280gsm (130lb) rather than the normal 300gsm. There is also a 200gsm weight (90lb) and a much heavier one. The paper is composed of 60% cotton 40% linen and hand made. The Velke Losiny Mill http://handmadepaper.tripod.com/13en.htm that produce it has been in business since 1492! It is expensive finally costing over £2 a sheet. I say finally because it was difficult to find out exactly what it was going to cost based on an initial price list from the mill giving prices in euros with no carriage charges, which were guessed at. This all resulted in my having to pay a supplement as there was also 20% Czech Vat to be added. They initially sent the wrong weight (200gsm) and quantity so be aware. Why did I go through this tortuous process and was it worth it? At my last Charles Reid course in 2009 he was using this paper and spoke highly of it, although he said it was not quite as soft as Fabriano. A little later Bruce McEvoy of the Handprint site http://www.handprint.com/HP/WCL/paper2k.html gave it a very enthusiastic review. As a result of my initial enquiries to the mill, which I posted about way back - e.mails replied to in Czech etc etc I virtually gave up when a little later received a communication from John Vydra, who said he had been appointed UK agent for the mill. His address is : Bohemia Company, Mr.John Vydra, 3 Medesenge Way, London, N13 6DZ e.mail Kvydra@aol.com. it is much better as you can order the full range from Italian Art http://italianartstore.com/store/VelkeLosinyMoldau.html . A 25 pack of 280gsm A3 is $89.95 presumably plus carriage. This works out at over £2 a sheet given current exchange rates. Italian Art say it is "their best selling hand made paper"
I have only used one sheet so far so will defer judgement. It will have to be good to pay roughly twice as much as Fabriano Artistico.